I do also have other excuses, Mr Craig’s many and varied talents aside. Last weekend was spent in Gascony (more on that later), I’ve been doing some writing for a couple of people, I’m singing in my company’s Christmas carol service which requires attending practices (who knew?! ), and Andrew, Johanna and I have put together a slightly different WTSIM for you this month – but more on all of that later today. For now I will leave you with yet another quick-as-a-flash dessert recipe (seeing as tese are the only types I seem to have time for these days!!). I think the original recipe comes from the South African Microwave Cookbook, which my mom bought shortly after acquiring our microwave oven in about 1988. We were among the last of our friends to get one and my bvrother was practically begging her by then. You see, his friend Kenneth’s mom had one, and by some weird kink in the time/space continuum it had encouraged these two teenage boys to cook. After school at Kenneth’s house they used to concoct something they’d call “microwave munchies” – basically an open toastie piled high with a mix of grated cheese, mayonnaise and finely chopped salami. A heart attack on a plate but scarily addictive! So by the time the microwave arrived in our house, it was a thing of wonder and awe, and we enthusiastically set about experimenting – hence the purchase of the cookbook. These apples were a standby in my kitchen for many years. They delight children and adults alike, not only by their taste, but because if you peek into the microwave or oven while they are cooking, the do in fact splutter like little volcanoes. 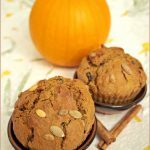 Over the years, I’ve tinkered with the recipe a bit, adding the raisins and almonds – so feel free to make your own adjustments too. 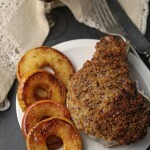 It’s also a great way to use up mealy apples, as the mealiness does not matter so much when they are cooked. Toast the almonds in a dry frying pan until golden – watch them as they catch easily! Set aside. Wash and core the apples. Make a shallow cut in the skin completely around the equator of each apple (to stop the skin splitting) and place either in individual ramekins or a large heat-proof dish. Divide the sugar, butter, raisins and cinnamon equally between the apples and fill the centre of each fruit in layers, starting with raisins, butter, sugar and cinnamon, and repeating until full. Pack the filling in tightly, spreading the top of the apple with a little extra butter and sprinkle with a little extra sugar to caramelise. Cover with wax paper and microwave on full power as follows: 2-3 minutes (1 apple); 3-4 minutes (2 apples); or 10-14 minutes (6 apples). If using the oven, place the fruit in an oven-proof dish, add enough water to cover the base of the dish and do not cover. Bake at 180C for approximately 45 minutes, or until the centre of each apple is cooked (test with a skewere or sharp knife). Serve by spooning the caramelised juices over the fruit and topping with a liberal glug of double cream. Scatter the toasted almonds over the top. 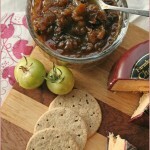 Spicy green tomato and apple chutney – move over, Mrs Ball! Wow, Jeanne, this is surely something I will try and I am sure it will become a winter addiction. It is as hot as hell here at the moment, but I am salivating looking at this!!! I love finding new ways to use my microwave. Aside from melting stuff, it doesn’t get much dessert-use. This looks soo hearty and delicious, and quite apt now, as we have more apples than we know what to do with! This dessert looks awesome! I’m going to add it to my list of yummy holiday treats I’d like to make this season. In other news, I also spent two hours this past week drooling over Mr. Craig in Casino Royale…yummmy. Great minds, Jeanne… great minds. 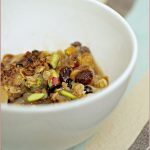 My kind of pud – quick, simple, yet so damn tasty (looking)… will be soaking those raisins tonight! I would be delighted to have this served to me for dessert…Aetna Apples! I can totally see two teenage boys making snack food in the microwave. I have to say, these apples sound much better than the mayonnaise concoction! They’re beautiful, too! I love how quick and easy these are – they looks great! Oh yum. If only the Germans would buck up and start stocking soft brown sugar, my life and my sugar addiction would get a whole lot more exciting. In the meanwhile, I shall merely drool. Gorgeous volcani apples Jeanne! I don’t even have time for dessert, even a quick one so I think you are doing very well. Priorities! I cannot believe that Christmas is upon us and yes, my google reader currently says (1000+) at the top…. Wow, I am definitely going to be handing this recipe to Rox with a nudge, nudge, hint, hint, hoping she will present me with volcanic apples for dessert tonight! She loves baked apples and this recipe is SO much easier. That apple looks meltingly good. I wonder if my husband ever tried this? Daniel Craig is MY boyfriend, back off sista! Twenty years later, I still don’t have a microwave, but this and microwave popcorn are almost enough to make me relent and get one! I keep thinking of posts and then never getting round to them too – just not enough hours in the day at the moment.